Hello my friends, I hope this summer is finding you well and you aren’t melting like we are here in Florida! I can honestly say that this is one of the hottest Julys that I can remember. Luckily for me I have an indoor hobby that I enjoy! Poor hubby is out in his shed building me side tables for our guest room. I don’t know how he does it, but I love him for it! This card was started with my fellow STB teammate and good friend JoAnn at one of our local craft stores. And by started, I mean the image was stamped only. I decided not to do it at class, and brought it home to make it with my own personal touch. The image is from and the grass is from MFT. I colored it with my Spectrum Noir pens. I know it’s not colored like most people would color it, but I like the way it turned out. I am still learning how to blend colors. The sentiment is from Verve that I use all the time! Please consider coming over to Seize the Birthday and joining us for or “Bold and Bright” topping this next couple of weeks….we would love to have you! Remember the topping is always and option and not required. The DT and Surprise Party Guest Mynn did an incredible job as always! Gorgeous card and I love those summery colors. Beautiful colored flowers….love the outlining of them, they POP! And your background is bright and happy too! VERY pretty! So pretty. I like what you have done with the pretty flowers and the design. Nancy, this is pretty in your bold orange and yellow. Your coloring is awesome. And thank you for your comment on my cards. You are too funny . Hope you had a great time with Ty and his fiance. We finally had a beautiful sunny day today with a high around the mid 70’s. Perfect weather. Glad I could put a smile on your face! I sure wish we were neighbors every time we message one another, I think this! Super jealous of Colleeen! HUGS! You know… I never seem to have the exact right paper to match my marker colors so your perfectly paired blooms and background paper make me the teeniest bit jealous. Such a pretty design! LOL….I know right!! Thanks for stopping by you made my day! 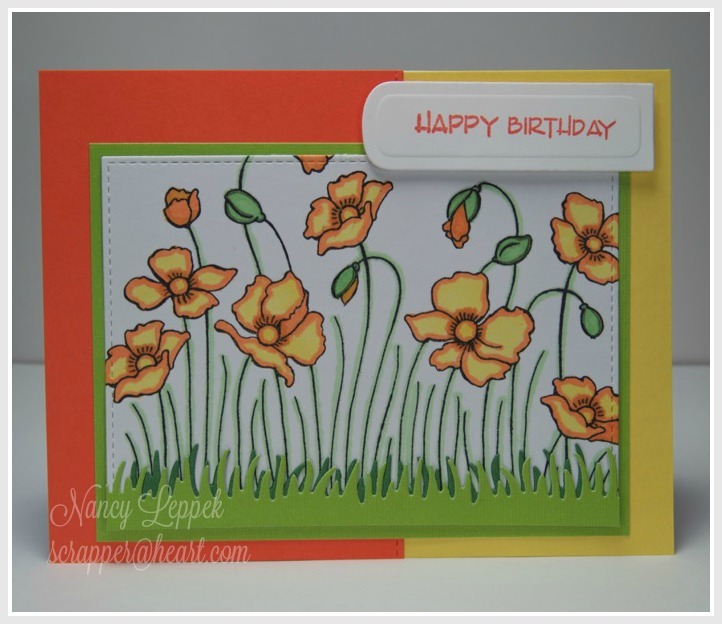 I love the split color background and those happy flowers…..lovely card! Love this colour combination! The colouring is wonderful too. Love it.